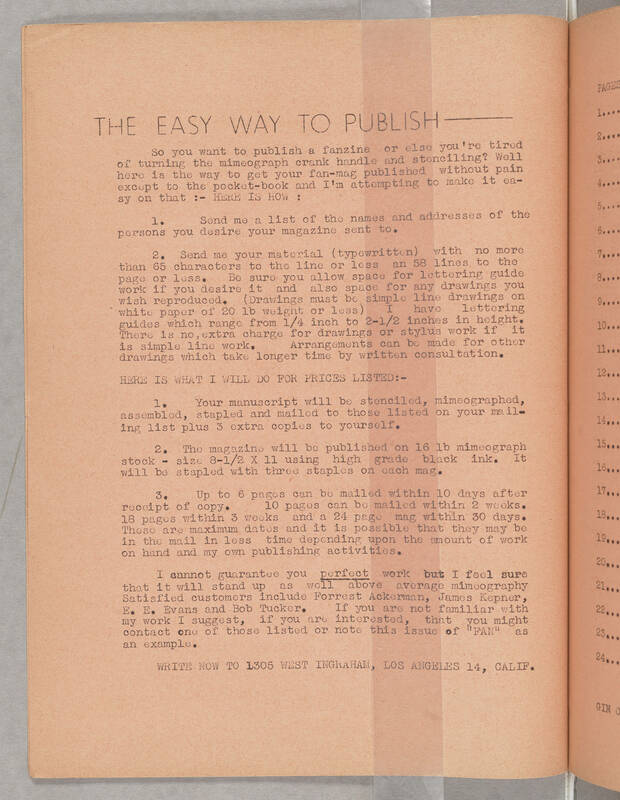 THE EASY WAY TO PUBLISH So you want to publish a fanzine or else you're tried of turning the mimeograph crank handle and stenciling? Well here is the way to get your fan-mag published without pain except to the pocket-book and I'm attempting to make it easy on that: HERE IS HOW: 1. Send me a list of the names and addresses of the persons you desire your magazine sent to. 2. Send me your material (typewritten) with no more than 65 characters to the line or less and 58 lines to the page or less. Be sure you allow space for lettering guide work if you desire it and also space for any drawings you wish reproduced. (Drawings must be simple line drawings on white paper of 20 lb weight or less.) I have lettering guides which range from 1/4 inch to 2-1/2 inches in height. There is no extra charge for drawings or stylus work if it is simple line work. Arrangements can be made for other drawings which take longer time by written consultation. HERE IS WHAT I WILL DO FOR PRICES LISTED: 1. Your manuscript will be stenciled, mimeographed, assembled, stapled and mailed to those listed on your mailing list plus 3 extra copies to yourself. 2. The magazine will be published on 16 lb mimeograph stock -- size 8-1/2 x 11 using high grade black ink. It will be stapled with three staples on each mag. 3. Up to 6 pages can be mailed within 10 days after receipt of copy. 10 pages can be mailed within 2 weeks. 18 pages within 3 weeks and a 24 page mag within 30 days. Those are maximum dates and it is possible that they may be in the mail in less time depending upon the amount of work on hand and my own publishing activities. I cannot guarantee you perfect work but I feel sure that it will stand up as well above average mimeography. Satisfied customers include Forrest Ackerman, James Kepner, E.E. Evans and Bob Tucker. If you are not familiar with my work I suggest, if you are interested, that you might contact one of those listed or note this issue of "FAN" as an example. WRITE NOW TO 1305 WEST INGRAHAM, LOS ANGELES 14, CALIF.